The English and Indian cricket teams made history at the Oval during the fifth and final test match which started on Saturday. Not in terms of runs, overs or wickets but in a more significant way. The two teams united to recognise the role of Indian soldiers during the First World War as part of the Royal British Legion’s movement to thank all those who served, sacrificed and changed our world. 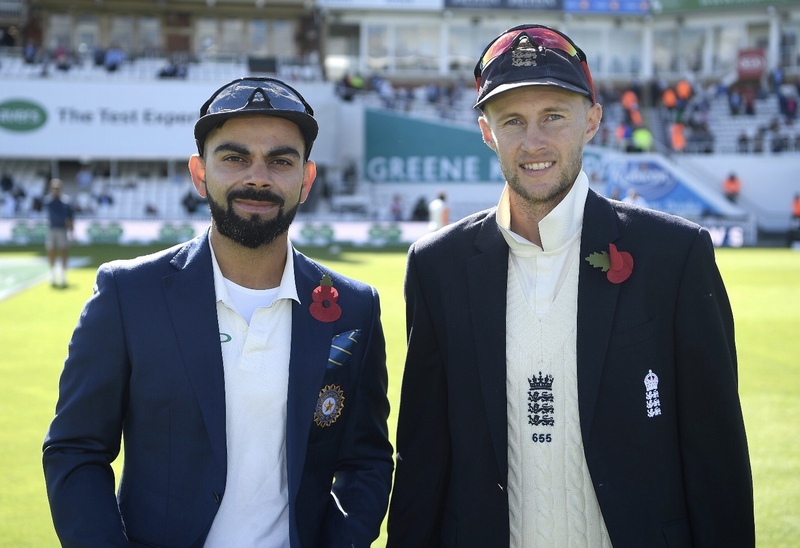 The two squad captains, Virat Kohli and Joe Root, are the first to wear a unique poppy made out of Khadi, the handwoven cotton closely associated with Mahatma Gandhi, which will be unveiled on Sunday 9 September at a special commemorative match day hosted by Surrey Country Cricket Club. Initiated by Lord Jitesh Gadhia and commissioned especially by the Royal British Legion to mark the Centenary of the end of the First World War, this red cloth poppy is otherwise identical in every respect to the traditional British symbol of remembrance.Other activity on Sunday includes a half time re-enactment of a cricket match played on the Western Front between the Royal Manchester Regiment and the Sikh Regiment of the Indian Army. The massive contribution of Commonwealth forces 100 years ago, particularly from undivided India, is a key focus for the Royal British Legion during this year’s special anniversary. More than 1.3 million Indian soldiers served in World War One across multiple continents, from the Somme to the Sahara, and over 74,000 lost their lives. They fought with courage and distinction, with 11 individuals awarded the Victoria Cross for their outstanding bravery. And Indians not only put their lives on the line but also made a generous financial contribution of over £20 billion in today’s money, as well as providing 3.7 million tonnes of supplies, over 10,000 nurses and 170,000 animals to the war effort. But figures alone don’t do justice to the human dimension. These were predominantly young men, who had travelled thousands of miles by ship from their homeland to fight a distant war. They adjusted to a cold and harsh climate with completely different food, language and customs. The first Indian soldiers arrived on the Western Front within six weeks of the outbreak of war, poorly prepared for the freezing weather, grappling with unfamiliar equipment and lack of ammunition. Some didn’t even fully appreciate the cause they were fighting for – but they did their duty and their nation proud. The solidarity of today’s cricketers in honouring these fallen heroes is doubly poignant. It matches the solidarity shown by India during Britain’s hour of need. And it uses an evocative symbol of India’s freedom struggle to provide a subtle twist to the traditional British poppy. Khadi is well known in India as the handwoven fabric made famous by Gandhi, who promoted the use of a spinning wheel to make India more self-sufficient and promote rural employment. As a result, the homespun cloth became synonymous with India’s Swadeshi, or independence movement. Although many associate Gandhi with non-violence and vigorously opposing the British Raj, his behaviour during World War One is highly revealing. At the outbreak of war, Gandhi was on a ship from South Africa homeward bound to India, with a scheduled stop in England. On August 6, 1914, he landed in Southampton and declared his unconditional support for the war effort, losing no time in calling a meeting of his Indian friends to raise an ambulance unit. He later wrote: “it was our duty to win their help by standing by them in their hour of need”. Gandhi felt that “England’s need should not be turned into our opportunity and that it was more becoming and far-sighted not to press our demands while the war lasted”. What was meant to be a brief sojourn in London, turned into a four month stopover during which Gandhi personally chaired a committee recruiting members for the Indian Field Ambulance Corps, setting up base in Eastcote, a suburb of North West London. He took special nursing classes along with his wife Kasturba and even secured the support of the Aga Khan. When Gandhi eventually returned to India, he was also active in enlisting volunteers to the Indian Army, including from difficult to reach areas such as his home state of Gujarat. Openly proclaiming himself as the “recruiting agent-in-chief” he defied criticism from his own friends and colleagues arguing that to become equal partners with the British it was important for India to acquire the skills and ability to defend itself. Although he was always careful to make clear that: “I personally will not kill or injure anybody, friend or foe”, Gandhi’s principled and loyal support was crucial at a difficult time in India’s relationship with Britain. Director General of The Royal British Legion, Charles Byrne, said, “The First World War left so many legacies that positively impact our lives today, from ground-breaking social change to pioneering innovations. This Centenary of the ending of the First World War is a chance for us all the thank the British Armed Forces who fought and gave their lives, but also to the thousands who fought alongside them from India and across today’s Commonwealth, and the many men, women and children who played their part on the home front. I am very grateful to Surrey County Cricket Club for commemorating the Legion’s ‘Thank You’ movement during such an important game of cricket between England and India”.